“The way our industry works is going through a fundamental transformation; change is now not an option – it’s an absolute necessity for survival. 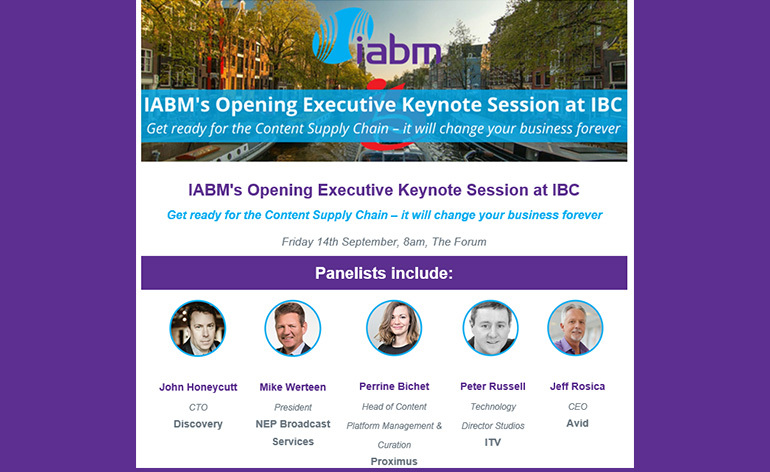 IABM’s Opening Executive Keynote Session at IBC will arm you with the knowledge you need to weather these changes, and lift the lid on why media technology users are moving to a creator-to-consumer Content Supply Chain operating model – and how we can all work together to realize its benefits. IABM CEO, Peter White, will open the session with a review of the current state of the industry based on IABM’s extensive research and business intelligence. He will then provide an analysis of the challenges the industry is facing, and share research-backed business advice on how to move forward confidently and successfully as our industry transforms into a content supply/media factory.